This cylinder seal came from the Megiddo water system. This makes a precise date impossible, but the imagery is typically Neo-Assyrian, from the late tenth to the late seventh century BCE. It is approximately 4cm high and is made of olivine, a mineral composition typically found in dark igneous rocks like basalt. It is slightly worn, blurring the image somewhat, but the main features can still be seen. This seal has seven stars in the upper left, probably signifying the Pleiades, and the star of the goddess Ishtar on the far left side. A bearded figure is on the far right, fighting a winged dragon in the centre. Another dragon lies face-down on the ground under the deity’s foot, symbolising its defeat. The deity may already have defeated one dragon and be in the midst of battling a second, or the seal may simultaneously show the battle and its outcome, emphasising that the deity is ultimately victorious. It may depict the god Bel (Marduk) fighting the dragon, although it also resembles a seal from Emar, in which Ninurta fights the Anzu bird—or it could be the chief deity of the Neo-Assyrian pantheon Ashur. In the second and early first millennia seals often had religious motifs; over time more and more text appears on the seals and in the Levant with aniconic (non-pictorial) seals eventually replace seals with text almost entirely. When a document was sealed with cultic imagery it may have been meant that the god(s) witnessed the sealing of the document and its contents, lending a divine imprimatur to the details and emphasising that they should be carried out exactly. 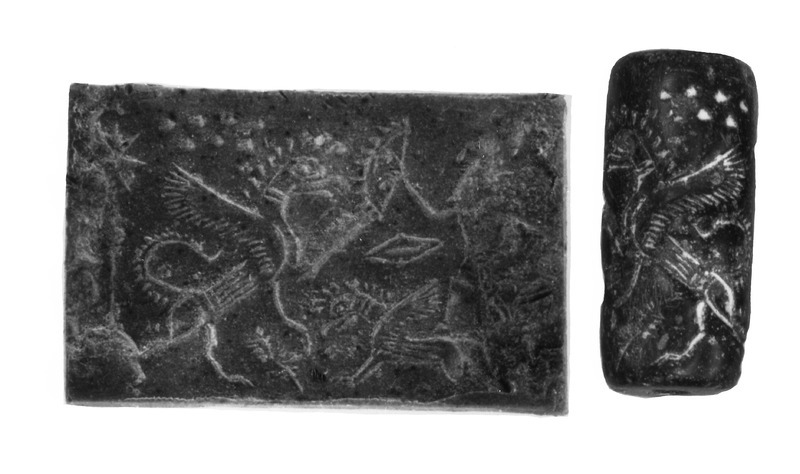 Alternatively, such seals may have symbolised the owner’s devotion to the deity, or been used for a specific function such as signalling that the document was a certain kind of communication, involving a person or temple connected with the deity. Olivine cylinder seal; Height: 4cm.